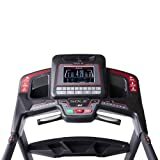 The F85 also incorporates the largest deck that SOLE offers, an exceptional 22″ wide running surface and 2.75″ rollers making this treadmill truly comfortable for any type of user. Without question, the top of the SOLE folding treadmill line. Just press a button and take your stride to speeds up to 12 mph. In fact, the F85 can handle users weighing up to 28 stone. This model has up to six auto programs and two user-customised workouts. It also has two separate heart rate control programs. *New for this year, the F85 also now includes blue tooth capability. Allowing users the freedom to transfer workout data from their fitness equipment to their smart device. Users can track their fitness info on the Sole app, or have their data be transferred to other compatible fitness apps. The Best Folding Treadmill On The Planet The top model in the folding series and SOLE’s number one seller, the F85 treadmill incorporates all the specs of the F83 plus features the highest horse power motor that Sole offers. A truly impressive 4.0 CHP Continuous Duty CHP motor with output and performance second to none. A Great Workout The F85 also incorporates the largest deck that SOLE offers, an exceptional 22″ wide running surface that is comfortable for any runner. Without question, the top of the SOLE folding treadmill line. Just press a button and take your stride to speeds up to 12 mph. In fact, the F85 can handle users weighing up to 28 stones. This model has up to six auto programs and two user-customized workouts. It also has two separate heart rate control programs. It’s fully equipped with all the programs and customization you’d expect.The heart-rate control option automatically calculates your recommended target range based on your age. Easy Assist Folding Our Easy Assist Folding Deck Design features a patented all gear rack & pinion system with the Safety Lock Deck design that locks the deck into place when the treadmill is in the upright position.